A Football Gumball Machine...every football fan I know would love this fun party favor idea! I just found this Football Gumball Machine...take a look at it and tell me your kids wouldn't love it! Well, every kid at a football party would love it...so if you are planning a kids football or a Super Bowl party this year, here is the perfect party favor for you. Imagine the screams of delight your party guests are going to give...they will be so thrilled to get this really cool favor. And it's a perfect match for the party theme...football. This time of year everyone is thinking football...that's because the Super Bowl is coming. And that is the biggest football day of the entire year. Get the Super Bowl party food ideas out of the recipe box...Nachos, Wings and Chili...can't go wrong with that combination! Find some fun party supplies with a football theme or for Super Bowl XLV in the Oriental Trading Company online party supplies catalog. Party supplies plus lots of football items...games, game prizes, inflatable footballs, cow footballs, pig footballs, touchdown table games...take a look Plus there are some football crafts that would be fun at a kids party. I saw a couple Photo Stand Ins too...you can take everyone's picture with one of those...so be sure to check out all the fun party stuff at the Oriental Trading Company! Join in and write your own page! It's easy to do. How? 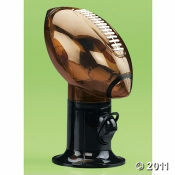 Simply click here to return to Super Bowl Party Games, Toys and Novelties.